He came with my pre-game Weisers and was obviously a good luck charm. For a game that started with the Riders dropping more balls than a room full of pubescent boys, it sure ended fantastically. Sure the conditions played a role but our defense absolutely dominated that game. They allowed just 14 points (7 of which were the offenses fault for a deep turnover), forced 9 turnovers (11 actually but 2 were called back on stupid penalties), held BC under 150 yards passing and chipped in a TD as a bonus. Simply put the Lions had no chance offensively. They were dominated. Having Weldon Brown back was a huge boost. I’m not sure if Andrew Harris slept with someone’s with daughter but man do they hate him in BC. I guess he lost out to Logan. Their loss, our gain. I really don’t see Lulay being healthy in time for playoffs so worst case scenario, DeChacho will be back to lead the progressively more inept BC offense against our ridiculous D at home… me likey. Offense was decent. They shook off a craptastic start and turned in a great first half. They went into coast mode a bit early in the second half for my liking but given the score and the way the defense was playing there was little need to take many risks. Running game was solid as always. Really like using Durant in short yardage again, if nothing else it changes things up and stops the defense from diagnosing the play before Willy has left the sideline. I have said before that even mediocre offensive performance tied with our defense is good enough and the offense did more than that. We will need better than that against the Calgary’s of the world but they got the job done convincingly and that’s all I care about. Isn’t that right white Andrew Greene? Overall this team did what is was supposed to and took care of business. For a nice change they did things the easy way and locked up a home playoff date and if Saturday was any indication Mosaic will be rockin’ whenever that playoff game is. Now we just gotta go to Calgary and keep pushing for first place. Buckle up because the best part of the year is just getting underway. - Loved the PR/IR Rider cheer squad, not sure what they were on to keep bouncing like that but it sure got the crowd going. - Crowd overall (at least those that showed up) were into it and loud. - Haven’t watched the replay yet but how do you take a roughing the passer call when the QB doesn’t even get knocked to the ground? 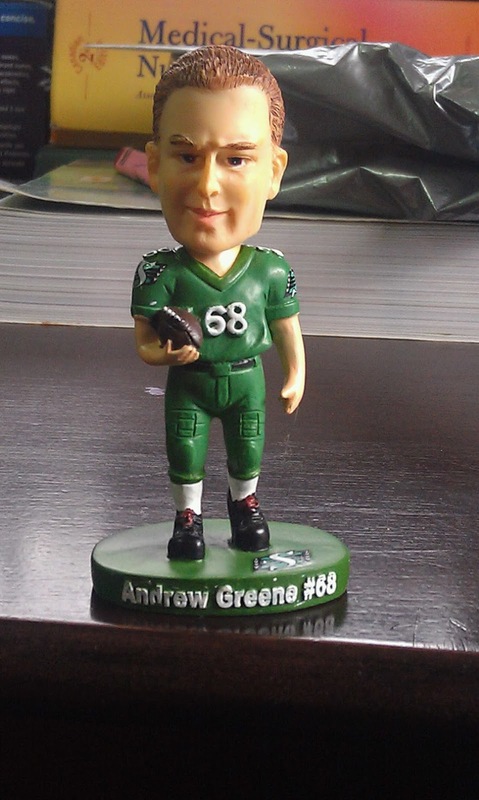 - Seriously, how awesome is white Andrew Greene? Having Taman or Hopson in there would have really been of the hook. Riders vs. Lions: Get Loud! Riders vs. Lions: Make It Stop!